Hair Loss Thyroid – issues should be dealt with through your GP primarily. A trichologist should be able indicate a possible thyroid issue upon examination. We assist sufferers in maintaining hair growth. The Thyroid Gland located in the back of the throat, consists of two large lobes and is responsible for producing hormones that maintain all the cells of the body. Over production (hyperthyroidism) causes the body to run too fast. Under production of (hypothyroidism) causes the body to run too slow resulting in a sluggist metabolism. The symptoms of such may appear gradually or suddenly and may well cause the patient to suffer mild depression. The link with hair loss should not be overlooked particularly in females. 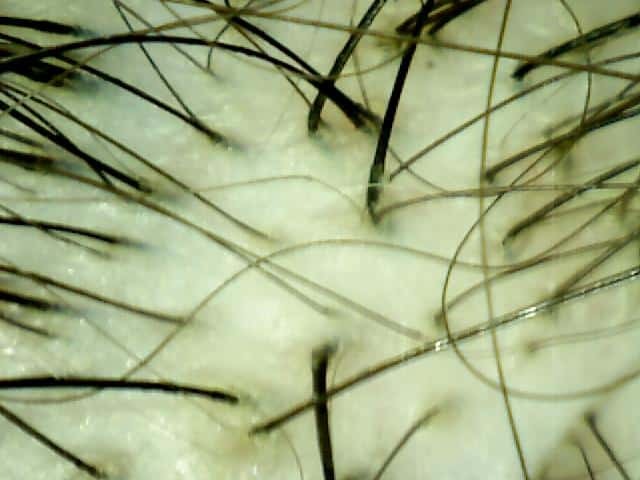 The following paper outlines some interesting points to consider if suffering from hair loss. Thyroid Stimulating Hormone (TSH) regulates the production of hormones. TSH is considered a reliable indicator in thyroid functions although it does not indicate low metabolic activity (mitochondrial energy transfer) or indicate the conversion of thyroxin (inactive thyroid hormone) to the active triiodothyronine (T3) which actively influences cells. TSH fails to monitor elevated “reverse triiodothyronine” (rT3) levels which create issues with T3 & T4 conversion and alter T3 ability to activate its cell receptors. Another important factor is that TSH is unable to reflect issues with nutrient levels which are crucial for T3 and T4 conversion and activation. Some patients may find that their test results for T3 & T4 are normal but they may be exhibiting symptoms of under active thyroid. This may be apparent if any of the above symptoms are apparent and is termed as Euthyroid Sick Syndrome). Thyroxin (T4) – produced by the thyroid gland (hormonal messaging from the pituitary/hypothalamus) and then circulated on proteins throughout the blood until synthesized in the kidneys and liver into T3. T4 is the inactive precursor to T3. Triiodothyronine (T3) – most T3 is converted from T4 (approx 80%) although some is created by the thyroid gland. T3 actively regulates our metabolism. Reverse Triiodothyronine (rT30) – produced in times of stress ( physical and emotional) or during illness, when conversion to T3 is altered to a conversion to rT3. rT3 is an adapted inactive type of T3. When stress levels are returned to normal, rT3 is removed from the body. Until this time rT3 continues to form. Those suffering from conditions such as Chronic Fatigue syndrome and Frbromyalgia tend to have high levels of rT3. Therefore rT3 is formed in place of T3 which inhibits thyroid functioning. Thyroid Antibodies – can be an indicator within the blood that our immune system is attacking the thyroid. It should be noted that some who have perfect functioning thyroid glands may present a low level of TA’s. The fact that there is any presences of TA’s in the blood should be noted and further investigated. High levels of TA’s tends to cause indicate autoimmune thyroiditis. Hashimotos may be apparent when the thyroid is under active and Graves Disease when symptoms present an over active thyroid gland. Thyroglobulin Antibodies & the most sensitive test being the Thyroid Peroxidase Antibodies (TPO Ab) are both examples of testing types. Toxic metals – Another aspect is the presence of toxic heavy metals such as lead, mercury, aluminium, arsenic and cadmium which can prevent vitamins and minerals required for normal T functioning. Although historical, a hair mineral analysis should be conducted to assess levels of toxic heavy metal. Hair loss treatment alone will not solve the problem. Hormonal or nutritional disturbances need to be address in the correct manner. Remember, hair loss is a symptom of a dis – ease within the body. I hope you have found this page informative and that you will consider us if seeking professional advice or treatment for any type of hair loss or scalp condition. Please feel free to contact the advice line above and a trichologist will be happy to speak with you in person. You can book a consultation either by phone or completing the contact page.